Even if your martial arts school is located in a small town, there are likely at least a couple of youth sports teams to sponsor. This can be a great way to boost marketing for your school. Your company’s name will be displayed on every player’s jersey, so hundreds of people will become aware of your martial arts school, most importantly, the parents there. If you want to attract more kids to your martial arts school this summer, get your current students to help. Develop a refer-a-friend program where students get rewarded for bringing in new members. For example, you could offer your current students a month of free classes or a gift card. Allowing your students to bring a friend to class once a month is another effective way to attract more kids to your martial arts school. These children will get to experience what martial arts is really like and may consider signing up for more classes. During a bring-a-friend-to-class day, try not to make the moves too difficult, as this can scare potential students away. Consider holding a free martial arts demonstration where a lot of people gather, such as a park. Karate by Jesse suggests contacting local news stations and telling them you are offering a martial arts demonstration that’s free to the public. When kids see the demonstration, they may get excited and ask their parents if they can take martial arts classes. 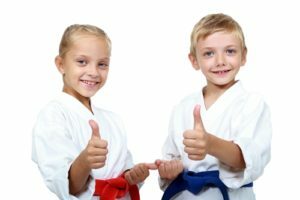 Parents will likely check out your website before signing up their kids for martial arts classes. If your website is messy and difficult to navigate, they likely will get frustrated and leave. Website Magazine recommends keeping paragraphs at a minimal length, sticking to just a couple different fonts and adding a search bar.